Search, compare, and finance your next car all in one conveniently located place! Get complete freedom with our FREE checking account with Overdraft Protection for added security. No matter what financial stage you are in we have a savings account that will meet your needs. Secure the money you need today. Low rates, flexible terms, a personal approach to financing. e–Statements give you quick convenient access to your monthly and quarterly statements. 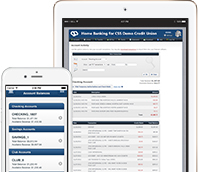 Download our FREE mobile banking app and access your accounts anywhere. Your savings are federally insured up to $250,000 NCUA (National Credit Union Administration) a US government agency, Equal Housing Lender. Saint Vincent Federal Credit Union is committed to providing a website that is accessible to the widest possible audience in accordance with ADA standards and guidelines. We are actively working to increase accessibility and usability of our website to everyone. If you are using a screen reader or other auxiliary aid and are having problems using this website, please contact us at (814) 452-5743. All products and services available on this website are available at our credit union office. Our site contains hyperlinks to other web sites operated by third parties. These links will take you away from our site. Please note that "+ CreditUnion +" does not guarantee the accuracy or completeness of any information presented on these sites nor does "Saint Vincent Federal Credit Union" represent either the third party or our member if the two enter into a transaction. The third party's privacy and security policies may differ from those practiced by the credit union. We encourage our members to know when they leave our site and to read the privacy statements of each and every web site that collects personally identifiable information. Our Privacy Statement applies solely to information collected by Saint Vincent Federal Credit Union's Web site.